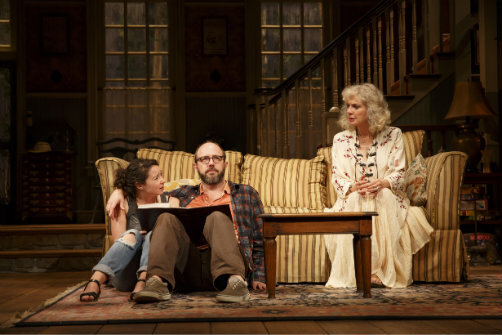 Sarah Steele (left), Eric Lange, and Blythe Danner in The Country House. Photo by Joan Marcus. BOTTOM LINE: A drama about a family of actors that lacks the authenticity necessary to pluck heart strings. In one of The Country House’s best moments, Blythe Danner glibly says, “there are no more Broadway stars, there are stars on Broadway.” The audience roared, not blind to the fact that Danner is, essentially, speaking of herself. Danner--a veteran of Broadway known more recently for being the mother of Gwyneth Paltrow and for her role in the Meet the Parents films--is of a generation that proved that one could no longer make a legendary acting career without leaving the stage; this appearance on Broadway comes at a time when celebrity appearances drive many of the biggest hits. It is these state-of-show-business conversations that make up The Country House’s most authentic moments and they always seemed to get a rise out of the theatre-industry heavy crowd at the preview performance I attended. It is unlikely, however, that this will resonate as strongly with less theatre-savvy audiences. That being the case, The Country House is probably only worth the hefty Broadway ticket price to a non-theatre person if you’re keeping a checklist of famous actors you’ve seen in person and the box next to Blythe Danner remains empty. Overall, the show lacks the authenticity and relatability it needs to propel the rather dramatic story to be deeply moving. Danner plays Anna Patterson, an aging actress who has enjoyed a successful career, but whose happiness has been seriously compromised by the death of her equally successful actress daughter, who succumbed to cancer one year prior in the very Connecticut vacation house where the family is now gathering. Also in attendance is her granddaughter (and dead daughter’s daughter) Susie (Sarah Steele in her Broadway debut), Susie’s father Walter (David Rasche), his new fiancé Nell (Kate Jennings Grand), and Anna’s son Elliot (Eric Lange, known for television roles in Weeds and Lost), whose failed acting career and slobby appearance make him the outcast, and often embarrassment, of the family. Sleeping on the couch is Michael Astor (Daniel Sunjata), a famous film star who is making a stage appearance at a nearby theatre festival and who Anna invites in when his hotel room isn’t up to his standards. Part of the problem with The Country House is that, aside from the fact that the family is recovering from an undoubtedly sad event, their privileged existence is always at the forefront. Forget “first world problems” which, embarrassing as they often are, we can all relate to. What we have here are “upper class first world problems,” and I think The Country House won’t prove relatable to enough people to garner the kind of audience a Broadway show needs to succeed. Take Elliott, for example. His life has been plagued with failed auditions and the inability to make it in the industry that his mother and sister have flourished in. Though it’s a little sad to see his sense of self-worth suffer, his dramatic cries for help ring more as the macabre peacocking of a grown-up spoiled kid who can’t figure out what to do with his time, rather than a genuinely alarming life crisis. Sure, Elliot is sad, but most of us know a lot of people who have much more urgent problems than he does.